Our business has the knowledge and expertise to fix any gate motor, install new gates, repair damaged wheels, hinges or rollers and ensures 24/7 emergency service. We are masters in gate repair services and have the best equipment in California. Full electric gate services by excellent, highly trained technicians! 24/7 emergency service, top maintenance service and repairs! Automatic Gate Repair Encino is a driveway gate contractor that can do everything from supply and install phone entry system / intercom systems to repair broken hinges / posts / damaged gates. 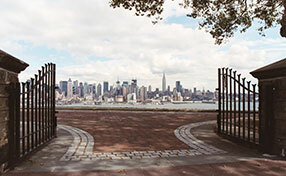 We are a driveway gate company that is always there for our residential & commercial customers. We have a 24 emergency repair service that makes us available to our customers anytime that they need us. If you are in need of a driveway gate service then we are the driveway gate contractor that you should call. Do not ignore existing problems, but use our automatic gate repair services for their effective and speedy resolution. Our extensive experience and expertise enable us to fix the most advanced electric operators and truly antique iron ornaments. When the problem is urgent, take advantage of our emergency service. Our technicians work with precision to implement the even the most specific solution from hinge welding repair to safety sensors replacement. Our scheduled services include professional new gate installation. Count on receiving the most functional and amazingly looking security or driveway gate. From the panels to the electronic components, the setup will be immaculate. For keeping the looks, safety and performance of the automatic system as the years pass, our scheduled maintenance service is the right solution. Custom Made gates in Encino is one of the most popular service offered by our company. This is a service that allows you to design your gate to your preference. These are all of the different kinds of gates that you can have custom made. Overhead gates, swing gates, sliding gates, wrought iron gates, iron gates custom made pedestrian gates, walk throw gates, driveway gates, parking garage gates, electric gates, automatic driveway gates and barrier arm gates. We offer those services for both residential & commercial customers. Wrought Iron fences are another popular service that we provide. Wrought iron fences can decorate any yard. This is a list of fences that we can do of wrought iron. Pool fence, commercial fence, house fences, Window Guards, Security Doors and Guards & Railings and much more. We can even do dog runs and pipe corrals. We are a company that has a lot of experience in iron work. Fences, doors or gates it does not matter we can still handle every piece of iron work that you need done. We can also install a driveway gate opener for you. This allows you to open your gate without ever having to get out of your vehicle. This way you can just push a button and the gate will open. We carry several top brands of driveway gate openers as Eagle, Ramset, Elite, Doorking, GTO Pro, FAAC and Eagle and Ramset Eagle. We also have MULTICODE, Linear, Reno and Viking. Our driveway gate contractors can not only install these for you, we can also repair any of these that you may already have. 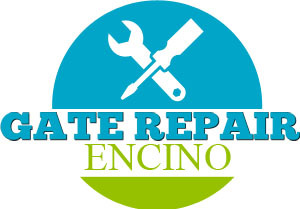 Of the many services that we provide one is the gate repair and install in Encino. We do this service for residential and commercial broken spring gate repair. We have a whole list of repairs that we can do. Some of these are broken gate repairs, hinges welding, post repair and broken hinge repair. Some of the other repairs and installs that we can do are gate track repair, gate wheels repair, safety gate sensor repair install and exit loop installation. We can even install gate motor on existing gate. We also do have a phone entry systems intercom service in Encino .This is a service that we provide for residential driveways or commercial driveways. It is important that you can tell who is arriving at your gate. Especially if you have a long driveway that does not allow you to see the gate. 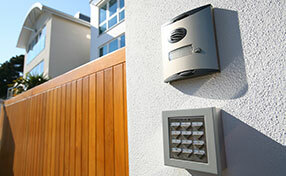 We offer keypads telephone entry systems, phone gate systems, residential and commercial Residential Entry Systems. We carry Commercial Entry Systems ELITE, LINEAR programming service and DOORKING. Each swing gate has two posts - one on each side. They enable its proper operation and allow for secure locking. The main reason why a property owner has to replace gate post is severe damage. When the optimal strength and stability of the post cannot be restored, it is replaced with a new one. The types of posts that are most vulnerable to damage are the wood ones followed by the iron and steel ones. Wood is at risk of decay and pest damage while the metal posts can corrode or get severely bent as a result of an accident. Gate post replacement can be required due to the installation of a new system. When the existing posts cannot bear the weight of the new gate or are too short to allow for proper installation and functioning, they are replaced with new ones. The new posts are set in perfectly straight vertical position and secured properly. 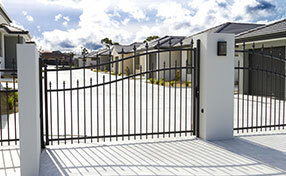 We are trained gate repair contractors who are highly skilled in all gate repair services. Whatever you need and want, we can address it with accuracy and perfection. With our long experience, we assure you that all our installations are crafted with 100% quality. With the right skills, we can provide only the best materials and tools of this industry. If you have personal specifications, we can give you the opportunity to pick everything you like – from colors, designs, and dimensions. We treat all our customers with respect, so your gate projects will be handled with exclusivity. Why Is the Electric Gate Not Closing? When you have an automatic gate, you get the best of both worlds - the highest level of security and great convenience. The truth is that over the years the extreme differences among gate materials are reduced due to their extended processing based on new technological means but still there are plenty of things to consider before you make your final choice.